For discussion on Mac software and video editing on Mac computers. 1) Make sure you have the newest version of MTR. 2) Go into your MTR preferences and turn the debugging log on. 3) Open the DVD in you Apple DVD player and start to play an Episode. While it is playing go to the menu labeled GO and scroll down to Track and hover there. The number that has the check mark next to it is the real Main feature and not one of the dummies. 4) Now go into MTR and under Title-Cell Extraction select the real Main Feature. (In the case of Murder Princess it is track 28) You can go ahead and demux if you want, but at this point it doesn't matter. Now hit go and let it rip. 5) Delete the files you just created for they still contain encrypted cells. This first rip was done to find them. 6) Now follow step 4 again, but this time look at the cells list in MTR and uncheck all the cells with Lb next to them. You can demux at this point if you wish. 7) Rejoice for you now have a clean rip of a new Funimation title! Remember this must be done in Cell extraction, all other options WILL fail hard! So only Macs can beat Funi at their own game? Would you like me to see if I can add this an addendum to my sticky? I've been having this problem with every FUNimation release about the time they started with the whole viridian collection thing. I had no idea what was going on. Thanks for the solution! MAC is a cosmetics brand. Mac is the superior computing platform. It's not an acronym. I've been out of the AMV game for awhile now, and just got a new idea for the original FMA series. Sadly my DVD Decrypter on my PC wasn't able to rip the dvd's I needed. Wasn't sure what was going on, but this makes sense I suppose. I'll have to see if I can find a solution for PC. Is there a way to do this using MTR 2.6.6 or another equivalent free program for Mac? I hear the only way to get MTR 3 is if you donate and I'd really like to avoid doing that if at all possible. CTCON 2009 FMV Finalist -- Romace: "Sousuke Sagara is Everywhere"
CTCON 2010 FMV Winner -- Best Drama: "Evangelion.0: You (Mustn't) Run Away"
Ok, so I ended up getting MTR3 after all...but I'm not sure I understand how this works or if I'm doing things correctly. When I play the DVD, watching the track listing as it plays, the "check mark" never changes it's position. It stays on the same track it was on before I turned on the DVD player. When I did this, it listed a bunch of clips under 10 minutes or so long, all probably adding up to the full length of the main feature. Nonetheless, I couldn't "select the real main feature." When I view the cell list, ALL of them have "lb" next to them, the only difference is a few of them in the beginning are highlighted in yellow. I eliminated these from the rip, but I must still have bad blocks because I can't complete an encode. I tried setting up the second rip, but nothing on the menus seems to have changed as alluded to here. For what it's worth, the DVD I'm trying to rip is Evangelion 1.01 You Are (Not) Alone. k8fin wrote: Ok, so I ended up getting MTR3 after all...but I'm not sure I understand how this works or if I'm doing things correctly. You just select Title 24 from the pull-down menu on your left. Make sure you are on the Mode menu and have Title - Cell Extraction selected. Yes all the clips, or cells, are the main feature ... you can either merge then together by keeping the merge cells box checked or uncheck if you would rather have them kept as individual mv2 files. For this disk just uncheck the first 8 cells and you should be fine. I ripped this disk for my last video and I know it works. 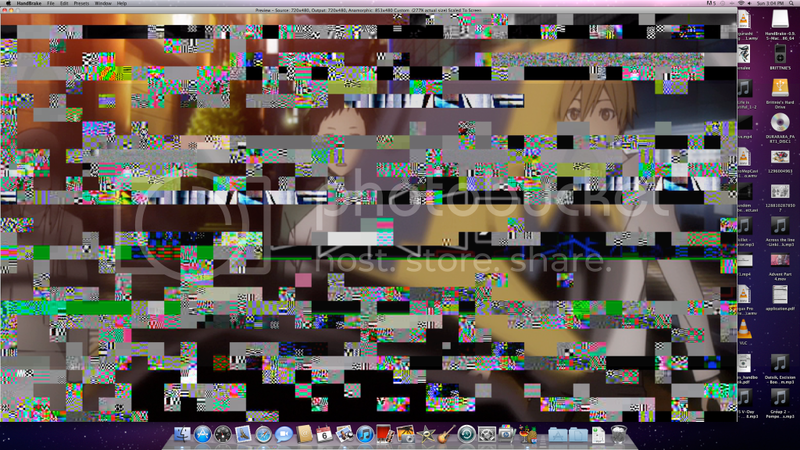 I am having trouble with the new release of Durarara! My cousin told me to use Handbrake to rip my dvds. But see here is a preview in the program before I even ripped it. And yes I have a mac if you cant tell. Do not use handbrake of your intent is the edit with the footage. Squirrel, Duke of Acorn wrote: Do not use handbrake of your intent is the edit with the footage. ohhhh then what can I use? The Origonal Head Hunter wrote: So only Macs can beat Funi at their own game? Ya, it's easire on a PC. I just rip them without thinking, even BRDs.